Morus alba is a tree to 15 m, trunk branching low, curved, crooked; bark yellow-brown, deeply fissured, ridged; twigs yellowish. Winter buds round to bluntly elliptic, roughly 0.4 cm wide, red-brown, scales overlapping; leaf scars roughly 0.3 cm wide flat across top, shallowly shield-shaped (Gargiullo personal observation). Morus alba.leaf variation. (c) 2002 Steven J. Baskauf.Copyright.creativecommons.org (Accessed 1/2017). Leaves alternate, very variable, from unlobed (especially leaves on new shoots), to deeply irregularly lobed, surface mostly smooth, hairless above, finely hairy only on veins below, margin toothed, base lobes often unequal, (Petrides 1988). Flowers tiny, in small catkins; blooms May. 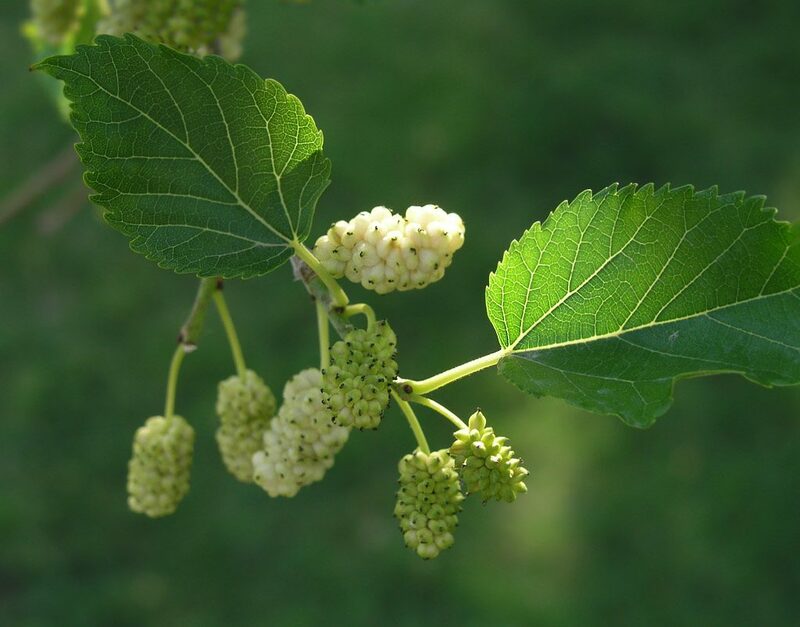 Morus alba.white fruit.commons.wikimedia.org (Accessed 1/2017). Fruit fleshy, multiple, in small drupes, white to dark purple, July-Aug., bland tasting, deciduous, pulp lipid less than 10% (White and Stiles 1991). Eaten by birds and mammals, which disperse the seeds. 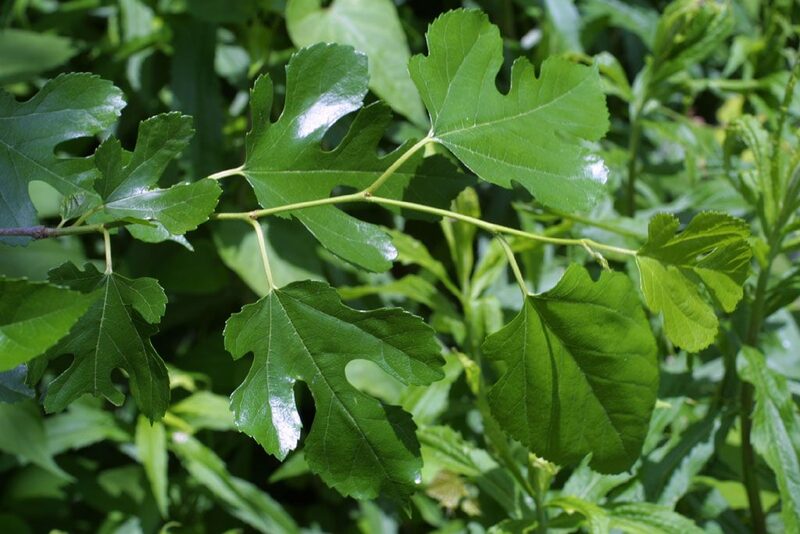 Habitat: Weedy exotic in regenerating woods, open, disturbed areas, woodland edges, around old house sites, fill, often a major component of second growth woods, displacing native species; soil pH 5-7 (USDA, NRCS 2010). 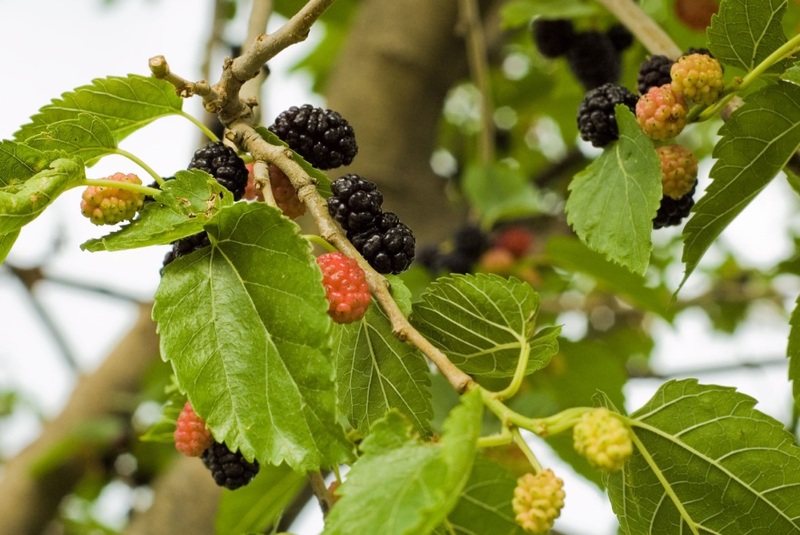 Notes: Infected by Fusarium lateritium (Deuteromycotina, Hyphomycetes), mulberry twig blight.